This entry was posted in Miscellaneous and tagged 1 G/O HPWS09, black abalone, Carmel, CC, cDNA, CE, CT, gel, Haliotis cracherodii, in-gel PCR, lake trout, Lean, library prep, Pacific herring, PQ, Sisco, siscowet, SOLiD, SOLiD libraries, WB, Whole Transcriptome Analysis Kit, yellow perch on 7 April, 2010 by kubu4. This entry was posted in Miscellaneous and tagged 1 G/O HPWS09, black abalone, Carmel, CC, CE, CT, Haliotis cracherodii, lake trout, Lean, library prep, Pacific herring, PQ, reverse transcription, Sisco, siscowet, SOLiD, SOLiD libraries, WB, Whole Transcriptome Analysis Kit, yellow perch on 6 April, 2010 by kubu4. This entry was posted in Miscellaneous and tagged 1 G/O HPWS09, black abalone, Carmel, CC, CE, CT, Haliotis cracherodii, hybridization, lake trout, Lean, library prep, ligation, Pacific herring, PQ, Sisco, siscowet, SOLiD, SOLiD libraries, WB, Whole Transcriptome Analysis Kit, yellow perch on 5 April, 2010 by kubu4. This entry was posted in Miscellaneous and tagged black abalone, Carmel, CC, CE, EtOH precipitation, Haliotis cracherodii, library prep, Micro PolyA Purist, mRNA, NanoDrop1000, Ribominus Concentration Module Kit, RNA quantification, SOLiD, SOLiD libraries, Whole Transcriptome Analysis Kit on 1 April, 2010 by kubu4. This entry was posted in Miscellaneous and tagged black abalone, Carmel, CC, CE, Haliotis cracherodii, library prep, Micro PolyA Purist, mRNA enrichment, NanoDrop1000, RNA quantification, SOLiD, SOLiD libraries, total RNA, Whole Transcriptome Analysis Kit on 31 March, 2010 by kubu4. This entry was posted in Miscellaneous and tagged 1 G/O HPWS09, CT, lake trout, Lean, library prep, mRNA, Pacific herring, PQ, Ribominus Concentration Module Kit, RNA fragmentation, Sisco, siscowet, SOLiD, SOLiD libraries, WB, Whole Transcriptome Analysis Kit, yellow perch on 25 March, 2010 by kubu4. 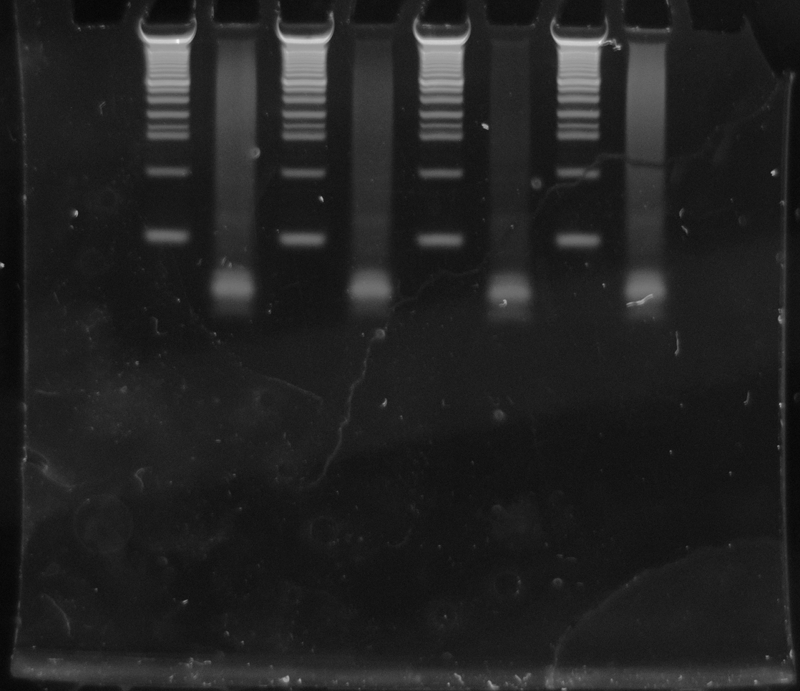 Emulsion PCR was performed with the two inner gel bands cut out earlier today according to the Ambio WTK protocol. PCR was run for 15 cycles. 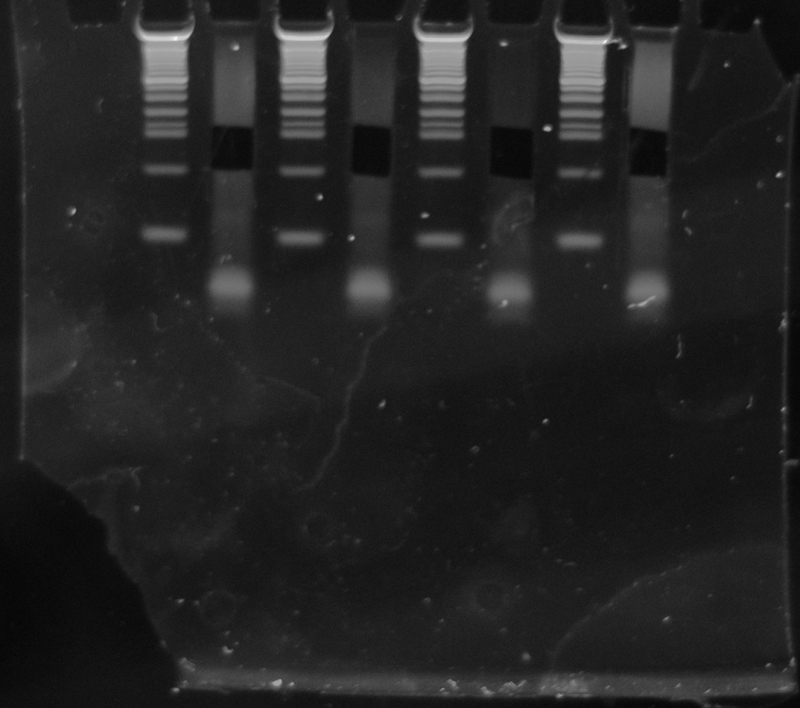 After the PCR, the samples were cleaned up using the Invitrogen PureLink PCR Micro Kit, according to the Ambion WTK protocol. The cleaned up cDNA (referred to as “libraries” from now on) was spec’d prior to running on the Bioanalyzer. All samples look good EXCEPT for 4L. It has a terrible 260/230 ratio and has a very low concentration, relative to the other three samples. Although not pictured here, the absorbance curve of the 4L sample was extremely poor and broad, unlike the other three samples. 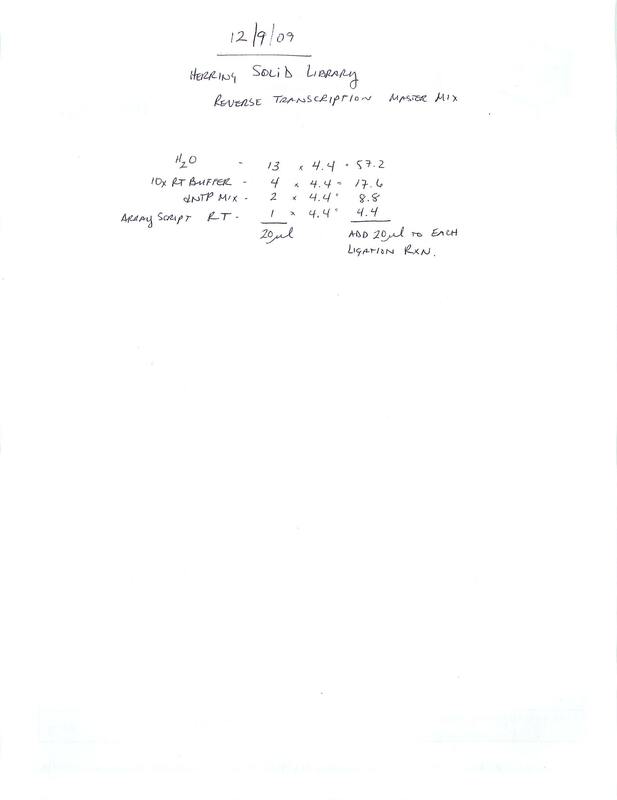 This entry was posted in Miscellaneous and tagged 2L, 3L, 4L, 6L, cDNA, DNA Quantification, ePCR, library prep, liver, NanoDrop1000, Pacific herring, PureLink, SOLiD, SOLiD libraries, Whole Transcriptome Analysis Kit on 9 December, 2009 by kubu4. Ligation reactions from yesterday were subject to reverse transcription according to protocol. Master mix workup info is here. Samples were incubated @ 42C, 30mins and then cleaned up using the Qiagen MiniElute PCR Purification Kit, according to the Ambion WTK protocol. After RT rxn, samples were run on a Novex 6% TBE-Urea gel according to Ambion WTK protocol. Samples were loaded, left to right: 2L, 3L, 4L, 6L. Ladders are to the left of each sample. The break in the smear in the 6L sample is a tear in the gel. This entry was posted in Miscellaneous and tagged 2L, 3L, 4L, 6L, cDNA, gel, library prep, liver, MiniElute PCR Purification Kit, Pacific herring, reverse transcription, SOLiD, SOLiD libraries, Whole Transcriptome Analysis Kit on 9 December, 2009 by kubu4. RNA from yesterday was speedvac’d to dryness and resuspended in 3uL of nuclease-free H2O. Samples were mixed with Adaptor Mix A and hybridized according to Ambion WTK protocol. Samples were then ligated for 16hrs @ 16C, according to Ambion WTK protocol. This entry was posted in Miscellaneous and tagged 2L, 3L, 4L, 6L, hybridization, library prep, ligation, liver, mRNA, Pacific herring, SOLiD, SOLiD libraries, Whole Transcriptome Analysis Kit on 8 December, 2009 by kubu4.